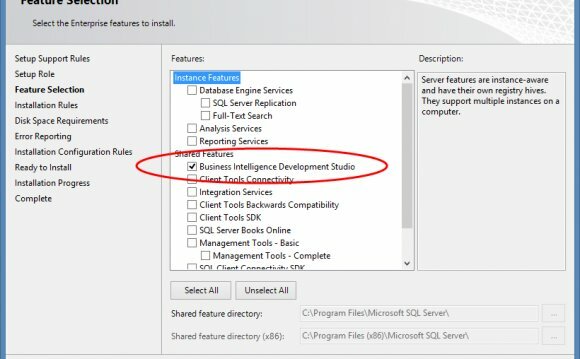 SQL Server Integration Services, SSIS, covers a whole lot of territory. I'll discuss what's relevant to this question of 32 vs 64 bit-ness. As you discovered, the installer is stupid but you typically only need to use it once or twice in a machine's lifetime. I'm ok with this as I'd rather them spend development dollars are the product and not the packaging. An SSIS package is a deliverable unit of work. It is an file with a .dtsx and internally is a bunch of XML. Typically, development of SSIS packages is completed by using Visual Studio. Whether you call it BIDS, SSDT or just Visual Studio, it's the same thing. There are registered templates for SSIS as well as all the toolbox entries that get put onto a machine during installation. That stuff supports the design time aspect. Visual Studio itself is still a 32 bit executable. Therefore, when you are creating packages using Visual Studio, the editor you are using to create a package is a 32 bit entity. Unless you are creating a multi-gig package, this shouldn't be an issue. On a final note, development of packages is not constrained to Visual Studio. There is a paid-for product, Mist, that uses Biml (a domain specific language that describes BI objects) to generate SSIS packages. Looking at your SO history, you look like you have some PowerShell chops, you can use PowerShell to modify SSIS packages or flat out create them. There the EzAPI to help with the COM side of generating packages. Intellinet is a management consulting and Microsoft-centric technology services firm.